The Dove & Rainbow, Upper Parliament St.
Will Richards, who was born in 1916, recently (August 2012) came to Blidworth Library in search of information about his mother’s family, the Pogsons. He recalled that they had run the carrier’s cart from Blidworth to Nottingham and Mansfield, almost to within his own living memory. During the 19th Century most villages were served by at least one carrier, usually a two- or four-wheeled covered wagon, similar to the type familiar from Westerns. 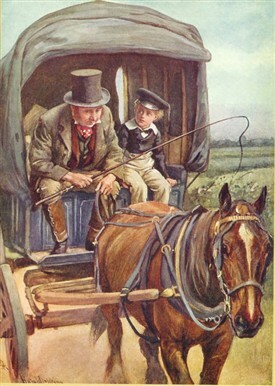 Mr Barkis and his 'lazy horse' are a good example from Dickens' David Copperfield (1849). For a small fee they carried goods, and even a few passengers, between village and town. Although railways must have made a difference, in many places the carrier’s cart survived right up until the 1920s, their final fate being sealed by the internal combustion engine and rural buses. In the 1841 England census we find Thomas Pogson, a 47-year old shoemaker, living at Norwood House with his wife Rebecca (also 47), their five children (aged between 3 and 15), an assistant shoemaker and an apprentice, as well as Francis Goodall (aged 70), his father-in-law. That is, ten people under the same roof. Clearly, with two employees and living in a large house, Thomas was doing well. He also appears in the Poll Books for 1841 and ’42, the address being given as ‘Norwood Hill’, his qualification to vote being that he possessed ‘Freehold house & land’. It was then rare for a tradesman like a shoemaker to have the vote, but here was the property requirement being fulfilled. The Parish Register records, however, that he died and was buried aged 52 in January 1846. 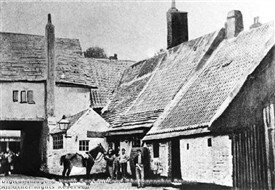 By the time of the 1851 census the widowed Rebecca had moved to New Lane and only had three children still at home, though an apprentice wheelwright, Reuben Herrod (aged 15) and her 9-year old nephew George Goodall, were also living there. The census enumerator started to write 57-year old Rebecca’s Rank, Profession or Occupation as ‘Cottager &…’ but crossed that out, leaving only ‘Carrier’ – which he underlined. Her eldest son, Thomas Jnr. (20), is also described as ‘Carrier’. This is further confirmed by White’s 1853 Directory of Nottingham in which Rebecca Pogson is listed as the Carrier ‘to Not. Sat., & Mansfield thnr. [sic = Thursday]’. She had a rival in the form of ‘William Wright, Mansfield thur.’, though Pogson’s were the only carrier from Blidworth to Nottingham. It was unusual for a woman to run such a business, although we can guess from the census that it was probably her son who drove the cart back and forth. Rebecca Pogson died aged 63 in April 1857. Thomas continued as carrier and is listed as such in the 1861 census, by which time he was married to Martha with two baby daughters, the youngest named Rebecca after her late grandmother. By 1871 he is described as ‘Farmer & Carrier’, Martha’s Rank, Profession or Occupation being rather quaintly given as ‘Farmer’s Wife’. They still lived with their daughters in New Lane, their nearest neighbour being the Station Master at Rainworth Station. There were also three sons, Henry, George and William, aged 7, 5 and 3 respectively. 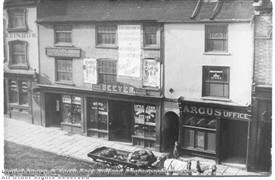 Wright’s 1874 Directoryof Nottingham and Twelve Miles Round reveals that the cart now went from the Dove and Rainbow in Parliament Street every Wednesday and Saturday at 4.00. ‘Brodie’ is mentioned as a rival, leaving from the Milton’s Head (where the entrance to the Victoria Centre now stands), also at 4 o’clock on a Saturday. The 1876 Post Office Directory of Nottinghamshire shows that a Henry Brodie was a shopkeeper and postmaster in Blidworth at the time, also listing ‘Pogson Thomas, carrier’. By the time of the 1881 Census, Thomas (aged 50) is only described as ‘Butcher’, though his 17-year old son Henry is now ‘Carrier’. Of course the business belonged to the father, listed as the only carrier from Blidworth in White’s Nottinghamshire Directory (1885-6). Ten years later in the census of 1891 poor Henry, still unmarried, is reduced to a ‘General Laborer’ [sic], whereas his father was now initially only described as ‘Carrier’, with the word ‘Farm’ added in another hand. This suggests that he still had the freehold property his father had owned and was still working the land. One wonders if the butcher’s business had been as a direct result of keeping cattle and sheep there? He is only described as ‘carrier’ in White’s and Linney’s 1894 Directories. The latter reveals that the Pogson cart came to the White Hart in Mansfield on Thursday and Saturday – and that there were now two other rival carriers. Thomas died aged 70 and was buried on May 1st 1900 (parish register). From the 1901 census we learn that the widowed Martha moved to Beck lane with her 28-year old unwed dressmaker daughter, also called Martha. Henry, however, now 37, had married an Alice Simpson; they already had three children (aged 4, 2 and 1) and were living with her widowed mother Jane in Burgess Place, Carrington. He was now working as a ‘Tram Stableman’; we know where he had gained his experience of looking after horses. Using easily-available documents like censuses (online), parish registers (microfiche) and trade directories (all available in Mansfield library Local Studies collection) we have been able to trace Will Richards’ ancestors, the Pogsons, running their business from Blidworth during half a century and through three generations. It was started by Rebecca around 1850, after her husband Thomas’ death. She was helped by her son, also Thomas, who continued it throughout the 1860s and ‘70s. He was helped by his son, Henry, though the Pogsons did not, it seems, continue working as carriers after Thomas’ death in 1900. This page was added by Ralph Lloyd-Jones on 16/08/2012.